The Art Life by Daniela Costa: Trio of Mini Canvas' Stampendous Blog Hop! Trio of Mini Canvas' Stampendous Blog Hop! 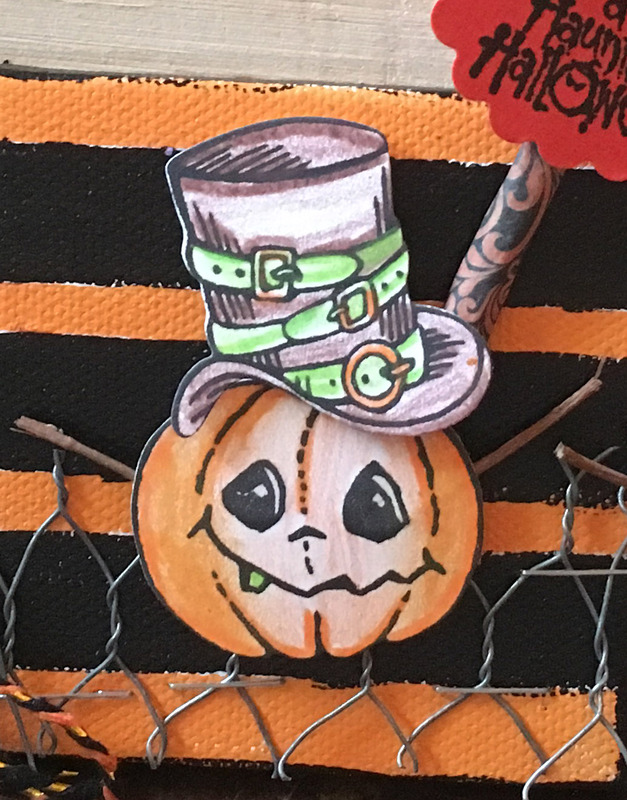 Welcome to the Stampendous 31 Days of Halloween Blog Hop! Hello! 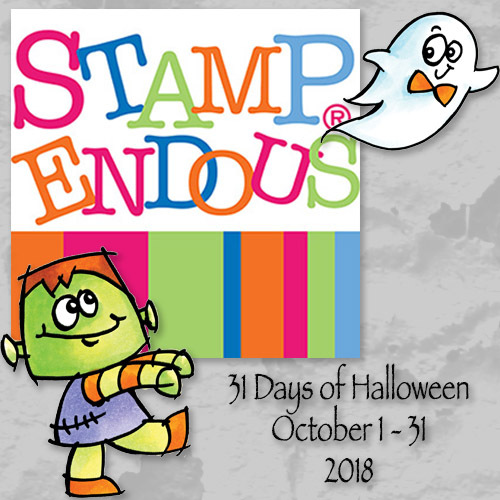 I'm so excited to be a part of the Stampendous 31 Days of Halloween Blog Hop! 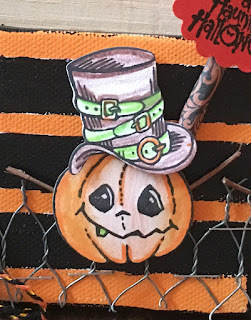 Today is my first post, and I'm sharing what I've done with the Halloween Hats Stamp/Die set. I absolutely LOVE the cute little faces these little guys have. The tall one is even a "Frankenstein" pumpkin. I really enjoy mixing up my coloring implements. On these guys I've used PrismaColor Pencils, and some Tim Holtz Distress Crayons. I've used a few different Halloween Sets for the sayings I've used on these (A full list of items is below). I love doing little mixed media pieces like these. The canvas' measure 3x3, and I've painted them in a striped pattern. Here is a close up of my little solo guy. I just love him! I even went outside and gathered some tiny twigs and have stuck them behind each of the pumpkins as their arms. I had this fun chicken wire fencing that I stapled onto the canvas to give it some depth and texture. Thanks so much for following along in the Stampendous Blog Hop! Make sure your commenting and submitting projects to win PRIZES! Make sure you go HERE to the Blog for more fun inspiration! These are just adorable, Daniela! Thank you so much for sharing them and creating with Stampendous! We'll be sharing them on the 7th, I hope it doesn't cause an inconvenience for you. They're just darling! Adorable art. Love the cute pumpkins. What a great project! I love the pumpkins! SO CUTE! This is so cool! I love the trio of pumpkin canvasses! The colors are so much fun! the mantle or as a door hanger. There is my gal! Great job, Daniela! Super awesome ideas and cute!! These are very fun! Love the Frankenstein one! possibly do with them. Thanks for the inspiration! Those canvases are so fun and cute. How cute are these guys! Love how you used them. You have been busy!, awesome work! These little faces on the adorable pumpkins are darling. LOVE what you did with them with the mini canvases, very unique and creative.